Biking Expeditions in the adventurous zones in Nepal and Tibet, such as Tilicho Lake, Around Annapurna, Mt. Kailash and Kanchenjunga, or biking from Kathmandu to Lhasa (Tibet) over the famous Friendship Highway are examples of the most exciting & thrilling biking experiences in the world. Yes, you can bring your own bike, knowing your own bike the best for the adventure trip. In that case, you are fully supported by Himalayan Leaders to get your bikes and luggage cleared through customs in Kathmandu and transported during your whole journey. Well, we know what kind of materials are needed for riding through the Himalayas. So we gladly can offer you the best of the best bikes for rent. We have 15 of the latest original TREK models (2008/2009) mountain bikes right at hand, available in various frames, sizes and fully equipped (in collaboration with TREK BIKES, USA). What about spare parts and transport facilities? 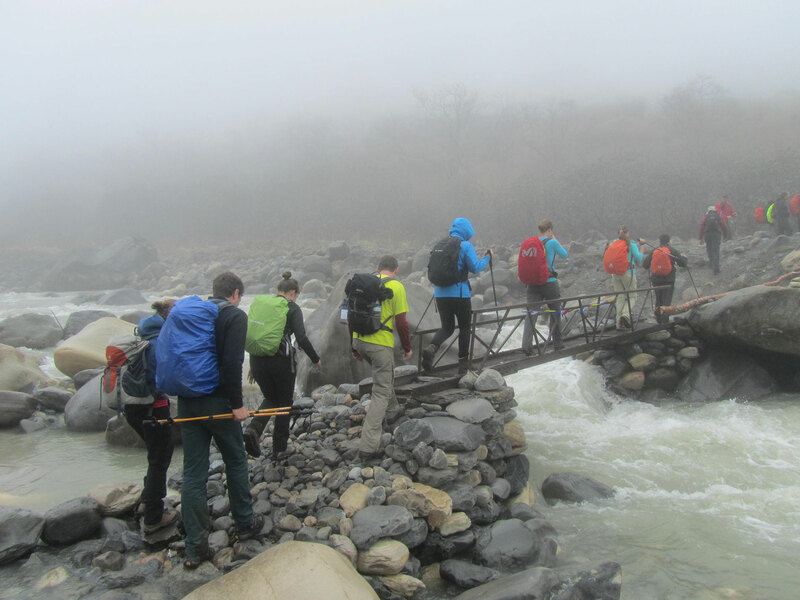 Himalayan Leaders provides all support by professional guides and always our tours include essential spare parts, luggage, camping equipment and food which is all carried by four-wheel drives. On a group of one-to-six, there is always one expert guide in each group. With more people, we will bring in additional guides. And where the roads stop in remote zones or mountains and the adventure is really to start out, we provide the sufficient number of porters to carry out the parts and luggage. For the popular ‘Friendship Highway’ Kathmandu – Lhasa biking trip, normally you depart in Kathmandu by airplane to Lhasa and bike all the way down to Kathmandu. Experienced guides will brief you and your party in all details before; the trip schedule, law, and orders in traffic and important tips about how to make a 100% accident-free safe journey. We are proud to express that in nine years since Himalayan Leaders started these adventurous biking trips, there has not been any serious accidental report! Himalayan Leaders takes many precautions on each bike trip to assure that safety comes always first. Therefore we strongly advise our guests to have all necessary travel insurances arranged prior to departure. Himalayan Leaders is associated with Kathmandu Int’l CEWEC Clinic whereby in cases of accidents we have direct access to the Medicare Centre which complies with most travel insurance policies. Of course, you must be aware that the Himalayas is not your average mountain area. Most people will experience some minor effects of altitude sickness due to staying for a longer period in (extreme) heights above 4.000 meters. These symptoms are normally nausea, severe headache, shortness of breath or general fatigue. We always try to prevent or minimize the risks which occur with serious altitude sickness. Himalayan Leaders constructs travel programs so that the risk of altitude sickness is minimal. Our experts are well aware of the major symptoms and will act immediately in case of serious signals whereby people must get to lower altitudes. In case of real emergencies in remote areas, we always have associated assistance with helicopter rescues and medical admittance. Accommodation during the tour / expedition? Accommodation varies depending on the tour. Himalayan Leaders has the full network of available hotels and depending on the choices of our guests, we’ll decide upon it the best price and/or quality. Teahouse: It is possible to cycle across well-defined trails and stay at interesting and authentic local teahouses. Your food and accommodation are arranged in locally built tea houses along the trail. They provide clean and comfortable beds, cold & hot water and the food is simple but good. Camping: on less defined adventurous trails we have to camp in the open. These trips will be accompanied by a team of cooks, porters, sherpas, and guides. This is probably the most exciting way to experience freedom and peace in nature. For these adventures, HimalayanLeaders is well equipped with faultless materials from branded companies. Best season for these trips? Nepal: February till May & September till December. All these described activities contain a certain risk by nature. But let us assure you that all our guides have had qualified first aid training and will always carry appropriate safety kits for various activities, such as mountain safety shelters, walking ropes and mobile phones and even satellite phones. In case of emergency, we are always capable to carry out all necessary rescue plans. The leader’s primary role is to ensure your safety, where your responsibility lies to listen and comply with guidance and instruction.